It's the type of unsexy story that just glides past without much notice these days -- especially with so much excitement and speculation over historic summits, presidential self-pardons, and dramatic culture war skirmishes dominating headlines. But the federal government has dug our national finances into a frighteningly deep hole, having made tens of trillions of dollars' worth in unpaid-for promises (i.e. "unfunded liabilities"), on which tens of millions of people are relying. We've been sounding the alarm on this for years, over the course of two presidential administrations. 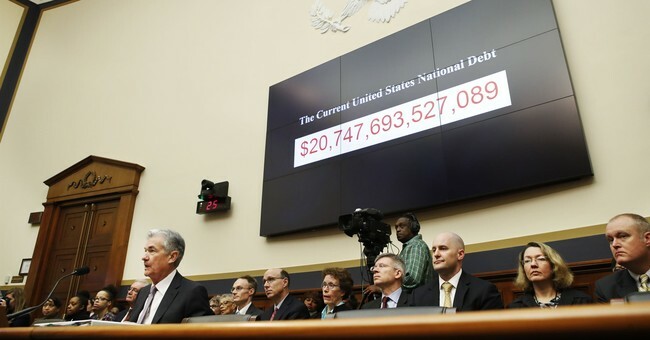 The looming debt bomb is a predictable crisis, and yet virtually nothing is being done about it. BREAKING: Government: Medicare will become insolvent in 2026, three years earlier than expected, Social Security to follow in 2034. Medicare will run out of money sooner than expected, and Social Security’s financial problems can’t be ignored either, the government said Tuesday in a sobering checkup on programs vital to the middle class. The report from program trustees says Medicare will become insolvent in 2026 — three years earlier than previously forecast. Its giant trust fund for inpatient care won’t be able to fully cover projected medical bills starting at that point. The report says Social Security will become insolvent in 2034...Unless lawmakers act, both programs face the prospect of being unable to cover the full cost of promised benefits. With Social Security that could mean sharply reduced payments for retirees, many of whom are already on tight budgets. The report said the total annual cost of Social Security is projected to exceed total annual income in 2018 for the first time since the Reagan era, meaning the program will have to tap into reserves. For Medicare, insolvency would mean that hospitals, nursing homes and other providers of medical care would be paid only part of their agreed-upon fees. Medicare is widely seen as a more difficult problem that goes beyond the growing number of baby boomers retiring. -- Social Security & Medicare face an $82 trillion cash deficit over next 30 years. --By 2047, they would take in 5.9% of GDP and cost 16.3% of GDP. The U.S. is now closer to the insolvency of the Social Security than to the attacks of Sept. 11. Trustees for the retirement and disability program revealed on Tuesday that Social Security will no longer be able to meet its obligations to beneficiaries starting in in 2034, or 16 years from now — which is less time than has elapsed since terrorists slammed airplanes into the World Trade Center and the Pentagon in 2001. In 2005, President George W. Bush was dismissed as an alarmist for highlighting projections that the program would begin spending more money on benefits than it takes in starting in 2018 and that its "trust fund" would be depleted in 2042. In reality, it has been running annual deficits since 2010, and the insolvency date has moved up eight years...As the Social Security crisis keeps getting closer, the political parties are moving further away from doing anything about it...What's scary is that Social Security is relatively easy to fix when compared to Medicare, a program where the rising retirement population is interacting with growing healthcare costs. And the trustees now say that program is going to be insolvent in 2026 — or roughly the same time as we are from the passage of Obamacare. I'll leave you with this parting thought: The red ink described above is harrowing and daunting, for reasons that should be screamingly obvious. Please consider that a sizable contingent of the Democratic Party looks at these exact same numbers and concludes that we must expand Social Security and expand Medicare to cover more than 300 million people, at mind-blowing cost. These are dangerous, denialist fantasies, and should be treated as such: With fierce, almost existential, opposition.